St Francis Chronicle November 2016 print edition is now online. 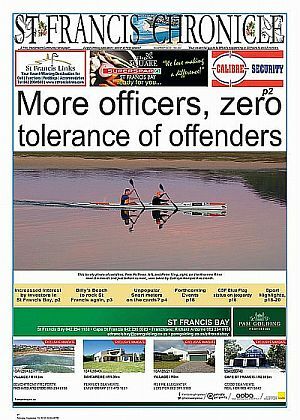 This free, community, print newspaper for St Francis, Kouga and Port Elizabeth readers has been placed online for the benefit of those readers living around Southern Africa or across the globe, who have holiday homes in St Francis, or who have family or friends here. Dear Editor, I would like to advertise an event on 16 Dec at the top of the Kromme River at River Kaya. Please let me know how I can submit an ad with a photo and what the price is. Thanks so much. Looking forward to hear from you.